TWU Local 100 9/11 pins and medals: Every transit worker who responded to 9/11 is entitled to a 9/11 Participation Pin from TWU Local 100. In order to get the pin you must assert in a sworn affidavit that you were engaged in duties during the rescue and recovery effort or your name must appear in the official MTA/NYCT list of those who served. 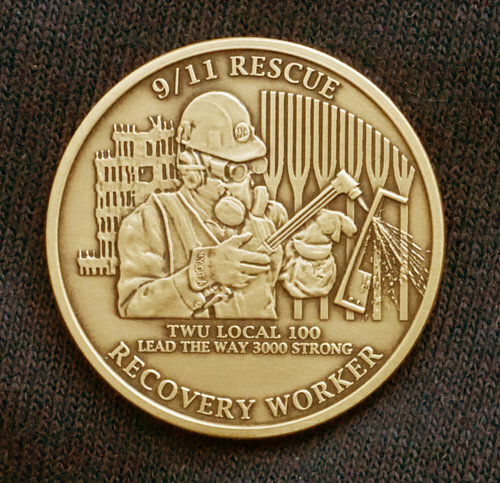 To get the 9/11 medal from TWU Local 100 you must have a verified claim of injury, approved by the Victim's Compensation Fund (VCF) of the US Government. It is not enough to have been screened or treated by Mt. Sinai or another health provider. Click here for samples of the acceptable forms of documentation which you must produce in order to be awarded a 9/11 medal from TWU Local 100. If you served at Ground Zero, we have information on resources to have your health monitored and obtain benefits you may be entitled to. Now, additional cancers have been covered as WTC related if you served at the site. Make sure you understand the rules and how to apply for coverage. For our comprehensive guide to 911 and how to claim benefits and get recognition, click here. If you need the official government "proof of presence" affidavit to attest your presence at Ground Zero, you can find it here. If you are an active, retired, or vested members of the New York City Employees Retirement System (NYCERS), you must act to preserve your rights to file for 9/11 related disability before 9/11/22. The form you need is here. First Responders, Local residents, office workers and students with cancer are now able to assert claims. Last September, the U.S. Department of Justice made an extremely important change to the Victim Compensation Fund (VCF). As a result, many people who missed the deadline to register for compensation can now do so. Until then there was a strict two year deadline to register a cancer claim with the VCF. The two years began to run from the date of diagnosis, which was a pathology report or other diagnostic test. Hundreds, if not thousands of cancer survivors (as well as family members of people who died from a 9/11 illness or cancer) missed the 2 year deadline because they simply didn't realize that there was a link between their cancer and the toxic dust. They certainly had no idea that they were entitled to compensation. The new regulation allows people diagnosed with virtually any cancer to register VCF claims within 2 years of the date of that they were told by the government that their cancer might be related to WTC exposure. This rule applies not only to WTC responders, but also to residents, office workers and students; basically anyone who spent time in Manhattan below Canal Street between September 11, 2001 and May 30, 2002. If you think that you or anyone you know might qualify, or if you want additional information, please have them call my office at (212) 671-8181. Sincerely, Noah H. Kushlefsky, Kreindler & Kreindler LLP, www.kreindler.com. Read our photographic record of New York City Transit at 9/11 here. Click on the image, to view or download. Our informational booklet, explaining the Recognition Program and outlining how to apply for compensation under the Zadroga Act/Victims Compensation Fund can be found here. 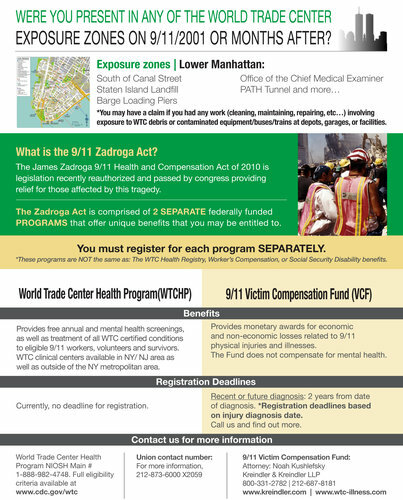 NOTE: To obtain compensation for 9/11 related illness, you will need to establish proof of presence at the World Trade Center site on 9/11 and later during the rescue and recovery effort. To do this, we recommend obtaining affidavits from co-workers or supervisors who were at the site. You can get the blank affidavit here. The TWU Local 100 Participation Pin (at left) is available to any transit worker who responded to 9/11 and served at Ground Zero. The pin is approximately 1.25 inches in diameter, and the Recognition Medal (at right) is approximately 3 inches in diameter. It is available to any transit worker who has documented injuries/illnesses stemming from service at Ground Zero. Find out more about these recognition items below. On 9/11/2001, 3,000 transit workers responded at risk of life and limb in the rescue and recovery effort. Some were ordered to go; many went to volunteer on their own. You may have been one of them. But our story has not been told. In fact, Transit provided all of the heavy rigs that were so critical in the first three days. Our iron workers were first to cut the I-beams that held trapped civilians. Our buses and trains brought New Yorkers to safety and then ferried in first responders. Our titles labored for weeks at the pile, doing whatever was needed. 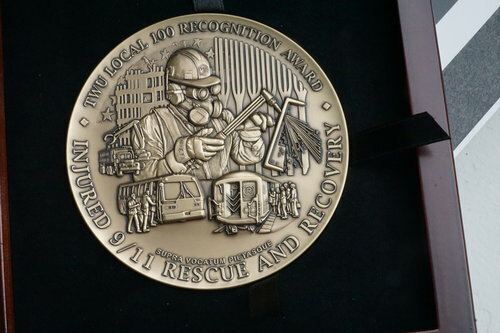 As of September 8, 2015, TWU Local 100 is awarding 9/11 Medals for those Injured at the WTC site, as well as Recognition Pins for those who worked there. The 9/11 medals are contingent on your receiving either a Workers Compensation Award directly linking your illness or injury to time served at the WTC site during the rescue and recovery effort, a notice of settlement of a claim stemming from your presence at the WTC site with the City of New York, or an approved award from the Victim's Compensation Fund (VCF), aka the Zadroga Act. To qualify for a Recognition Pin, TWU Local 100 requires that you (1) register as a 9/11 responder with the September 11the Memorial and Museum through this link, and (2) Fill out and submit this affidavit, which must be notarized, to the Union. The Affidavit can be mailed to the Union at the address on the affidavit, or can be brought in to the Union Hall. We were there: Watch the documentary, Above & Below, which includes great interviews with many transit workers. Uploaded by twulocalonehundred on 2016-04-26. TWU Local 100 wants to set the record straight. We are making sure that the stories of transit workers at 9/11 are told. On 9/11/2001, 3,000 transit workers responded at risk of life and limb in the rescue and recovery effort. Some were ordered to go; many went to volunteer on their own. You may have been one of them. But our story has not been told. In fact, Transit provided all of the heavy rigs that were so critical in the first three days. Our iron workers were first to cut the I-beams to clear the way for the rescue effort. Our buses and trains brought New Yorkers to safety and then ferried in first responders. Our titles labored for weeks at the pile, doing whatever was needed. A 9/11 commemorative pin of smaller dimensions will be given to any transit worker who can document their presence at Ground Zero. If you played a role in the rescue and recovery effort, please fill out the questionnaire below. Also, please send us your photos and your stories. This is the one chance we have, while the event is still fresh in our memories, to document what our Transit titles did on that fateful day that will always be with us. If you have photos which we could scan to add to the historical record of the WTC disaster, please contact TWU Local 100 Communications at communications@twulocal100.org . You can also email your photos to this address.